It is not like I need any. Not like Uberimma needs any, either. She has quite a bit of Noro yarn from Little Knits. She has been playing around with some and boy is it beautiful. so beautiful I started looking. Three of us went to the zoo today. We saw the male lion roar and beat on another lion; the tiger lying on the grass made large cat vocalizations; leopards of different spots; a jaguar and a small wild hunting cat; the rhino chomping poor hay; the polar bear swimming; some monkeys listless and with their backs to the public; one other monkey swinging from ropes who took the time to stop , aim and pee at the public; kangaroos dusting with two adult rabbits in their pen; three baby bunnies were in the hostas outside and Isabelle thought she might be able to bring one home, but that didn’t work out; one member of our party took a train ride; that same person also lay on the grass and tried out various tiger sleeping positions; flamingos preening; some unassuming deer and cattle; two beautiful, grand giraffes eating hay put high up for them to reach; several schools of fish in large tanks that came up from ground level to a height of four feet. We had a grand time. There was no red panda in his pen, but on a board outside was a photo of a red panda and a photo of a raccoon. Someone wanted to visit a raccoon. We kept an eye out for a zoo keeper to ask if the zoo had a raccoon, and if so, where was it located. But alas, when we found a keeper, she informed us they had no raccoons. So I told Someone he would have to come visit us and I would trap one for him. Which led to a discussion of what a trap is and why the raccoon could not get out of it. Among other things. Uberimma has relaxed security so all you who wish to catch up with her very interesting and busy life rush over and read all about it. And I fixed my link so you can go there with no trouble. The girl and I are in a City visiting friends. The girl thought yesterday evening that she would like very much to live in a city. We will see what she thinks by the end of the week. Although my daughter is above the age for these to be of use, I love the idea of the Skirty. And as well, I like R M’s marketing ideas. One of which is the fortnightly purse. An idea I will keep in mind for future use. Speaking with Jeni in Texas last night about Hurricane Ike reminded me of Isaac’s storm, the deadliest hurricane that ever hit Galveston. There is a book by the same name, a website devoted to the storm’s history; that one is down right now and makes me wonder if it is located on or near Galeveston; a recent review of Isaac’s Storm. The aftermath of Ike hit here last night with high winds. Some are without power due to trees and wires down. Up in Syracuse it is worse. 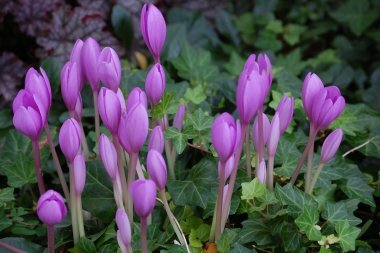 This is one variety of three different Autumn croci that are in bloom now.